Iran’s Supreme Leader Ali Khamenei said today that the Islamic Republic will not negotiate with the West regarding its presence and policies in the Middle East, the Iranian media reported. “At a time when America has a seditious and corrupt presence in all places, they frequently raise questions about Iran’s presence in the region. Should we seek America’s permission for our presence in the region?” Khamenei told a gathering of religious poets in Tehran. “How is this issue [Iran’s role in the region] related to you? Is this our region or your region? What are you doing in your region?” the supreme leader added. “Should we negotiate and talk with regional countries or you about our presence in the region?” Khamenei emphasized that Tehran will negotiate with Washington only when the former seeks to establish a presence in an American backyard. Comment: Khamenei’s remarks came after French Foreign Minister Jean-Yves Le Drian visited Tehran on Monday to convey American and European concern about Iran’s ballistic missile program and regional activities. Over the past year, Tehran has been counting on European support to dissuade the Trump administration from terminating the 2015 nuclear agreement and minimize the impact of unilateral US sanctions. But Germany, France and Britain – the three European signatories of the Iran deal – have recently told Tehran that while they want to keep the nuclear accord, they share Washington’s concern about Iran’s destabilizing role in the region as well as the country’s controversial ballistic missile program. French President Emmanuel Macron has hinted that European countries may impose new sanctions on Tehran. Iranian leaders have repeatedly ruled out any compromise with Western powers over the country’s missile program. 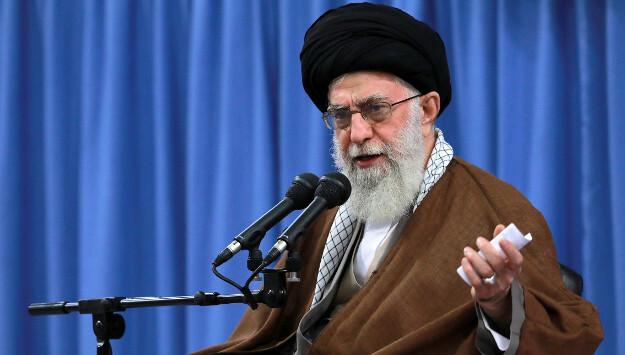 And as Khamenei indicated, Tehran is also unwilling to limit its military involvement in the region. Iran’s costly role in regional conflicts at the expense of domestic priorities was among key causes of antigovernment protests that engulfed Iran in December and January. During the nationwide protests, many chanted slogans such as “No Gaza, No Lebanon, Our Lives for Iran,” or “Leave Syria Alone, Think about US.” But Khamenei, who has the final say in all state matters, boldly rejected the protesters’ demand and defended Iran’s role in the region. “The powerful presence of the Islamic Republic in the region is one instrument of our national power. It depicts the nation powerful and it is a reality,” Khamenei said on January 9. He also emphasized Tehran would not negotiate with European powers or America over its military presence in the region.